Canyonville is underway! After all the swatching, I've decided on the Galway Highland Heather in color number #748, a sage green. 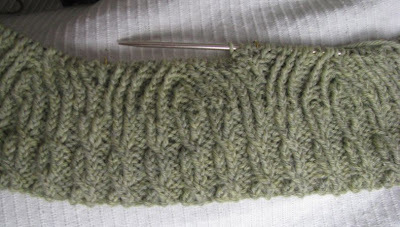 Ribbing is done and about half of one chart repeat. It will be knit in the round bottom up with raglan shaping. Still working on the Oversize Panel cardigan, a few rows each night. So much yarn, so little time! Anne, that is a lovely shade of green. I love Galway.